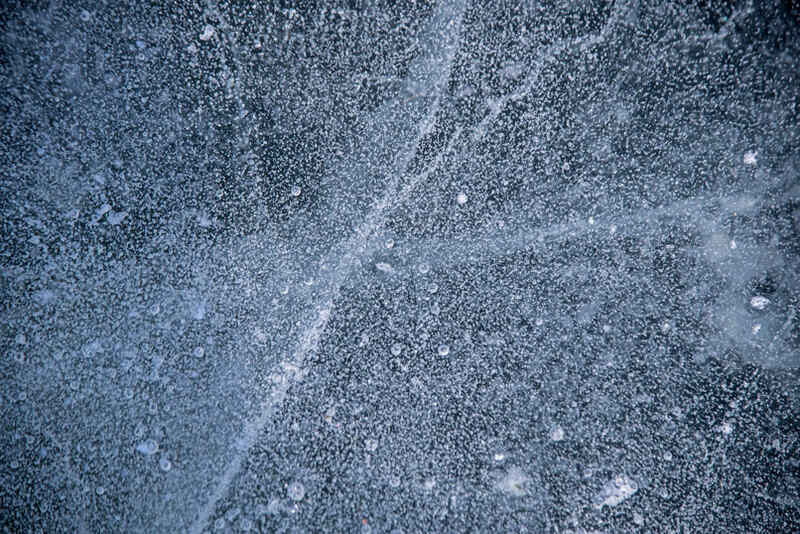 On one of the rare sunny days we have had recently I walked out on frozen Lake Menomin to take some ice photos. At the bottom Tripp Falls Ravine is a small spring fed stream that flows into the Red Cedar River. It is located about 1.5 miles outside Menomonie, Wisconsin. Access to the area is via a short steep trail which leads into the ravine. In the winter it can be treacherous because the stream and the ravine floor may be solid ice. You can hike up the gully for about a half a mile although the most interesting sections are found within the first 400 yards. 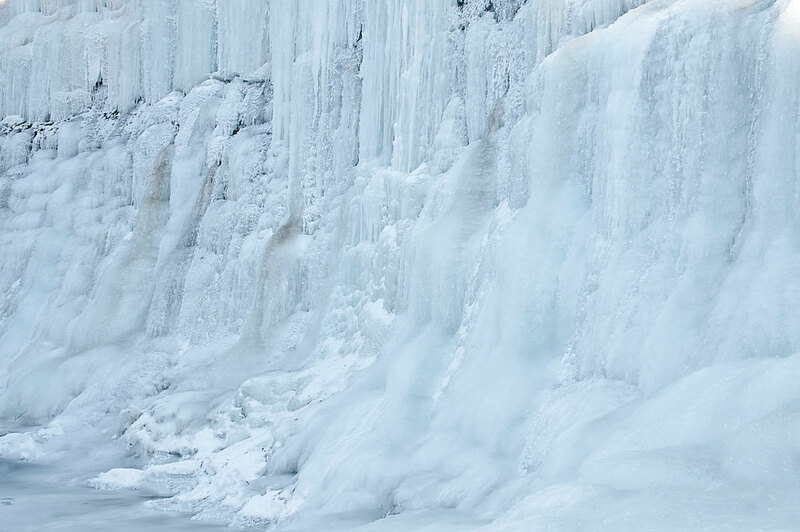 There are a variety of winter photographic opportunities which include the stream, frost, ice patterns,a large ice wall and several small waterfalls. Conditions vary a great deal in the winter. If it has been warm the stream will be open. If it has been cold the stream and the floor of the valley may be solid ice. If it has been really cold there may be a lot of frost shots. A short distance up the valley you will encounter a large ice wall and a 10 foot waterfall. It is possible but difficult to climb up the side of the waterfall. The climb over the waterfall can be a challenge on the snow and ice. There is a second small three foot waterfall about twenty yards above the larger waterfall. A sort walk above the smaller waterfall will lead you to the springs that feed the stream. I typically wear ice traction devices on my feet, during the winter, to prevent falls on the ice. Because the ravine is vary narrow photographing on a sunny day is difficult. The best light is usually on a cloudy or overcast day. As you walk down into the ravine you will encounter the small spring fed stream. The stream itself is not large but offers a variety of shots. 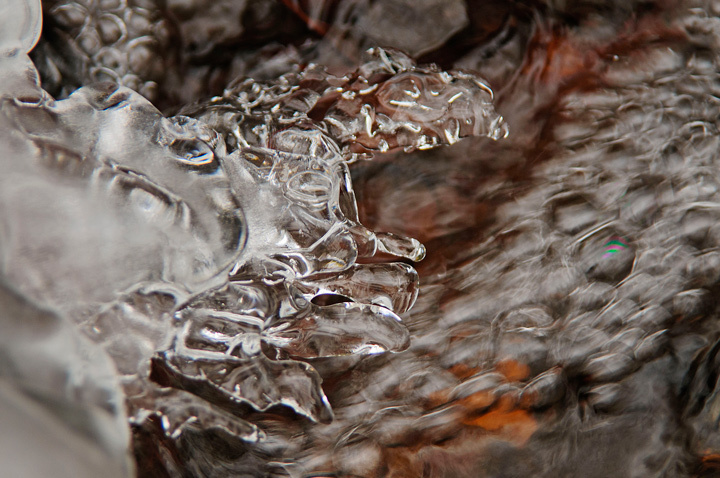 During transition seasons and during periods of warming and cooling the stream offers shots of the ice formations along the edge of the stream. When the stream is completely frozen and the temperatures are below zero you have the chance to shoot patterns in the ice and frost that forms on the ice. 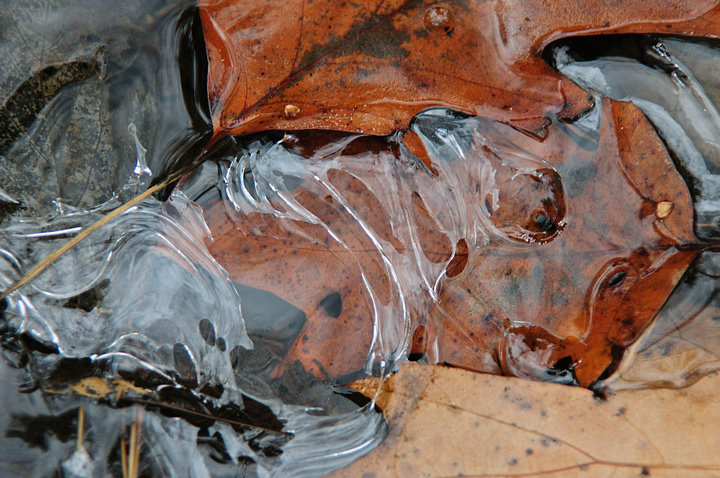 If you time your visit just right you can photograph ice covered leaves, twigs and ice formations that remind you of diamonds. 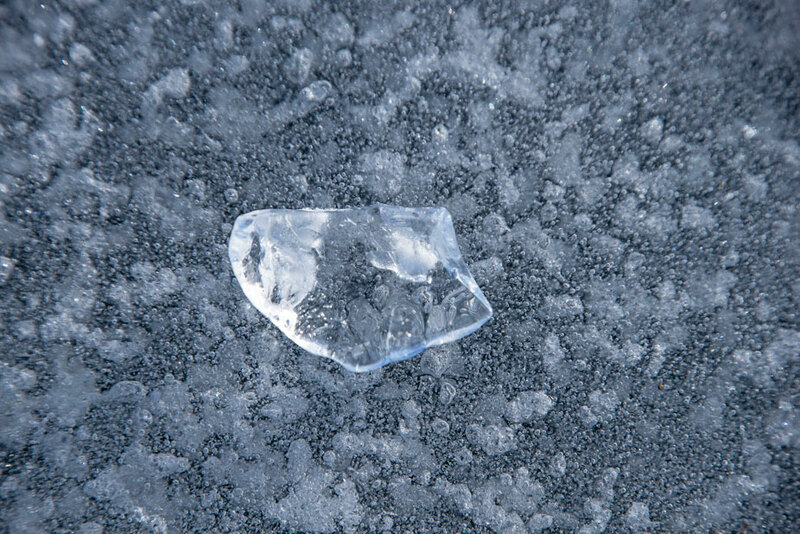 This opportunity may occur for only a few days during the transition periods when the ice is first forming or is melting. 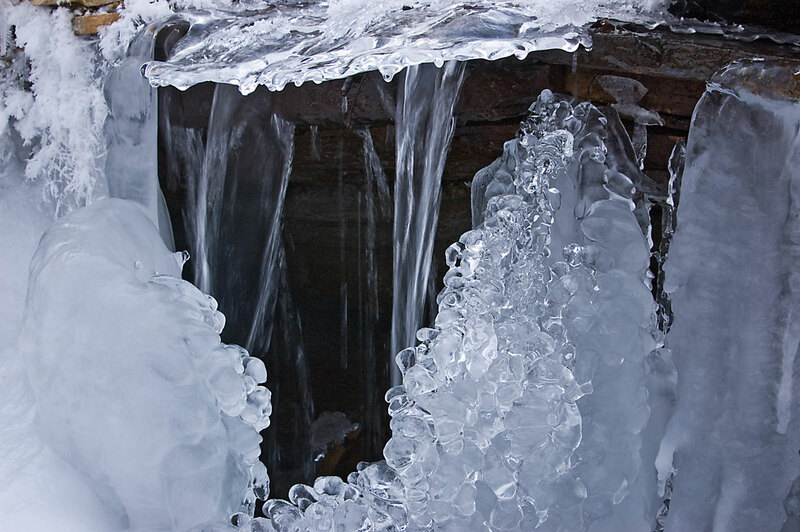 As you walk up the stream you will encounter large ice walls along the sides of the ravine. Throughout the year water seeps from the cliffs and during the winter producing these large ice walls. After a short walk up the stream you will also encounter the first of two waterfalls. 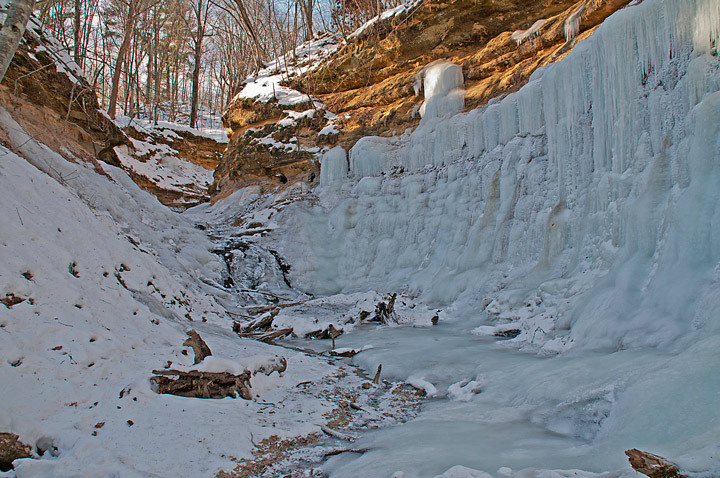 This shot shows the waterfall and ice formations at the end of the ravine. This is the largest at about 10 feet and is not so much a waterfall as water tumbling down over a sandstone slope. At times the water is open and at other times it is frozen completely over. 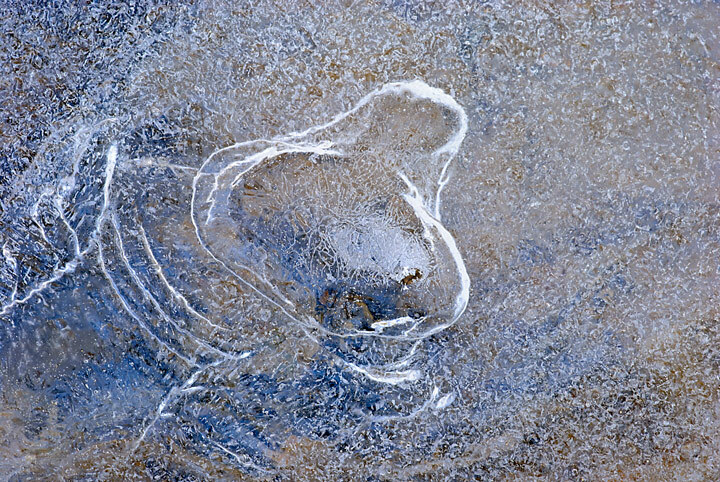 Normally there are opportunities for shooting ice patterns along the waterfall. To continue up the ravine you must climb along one side the waterfall. 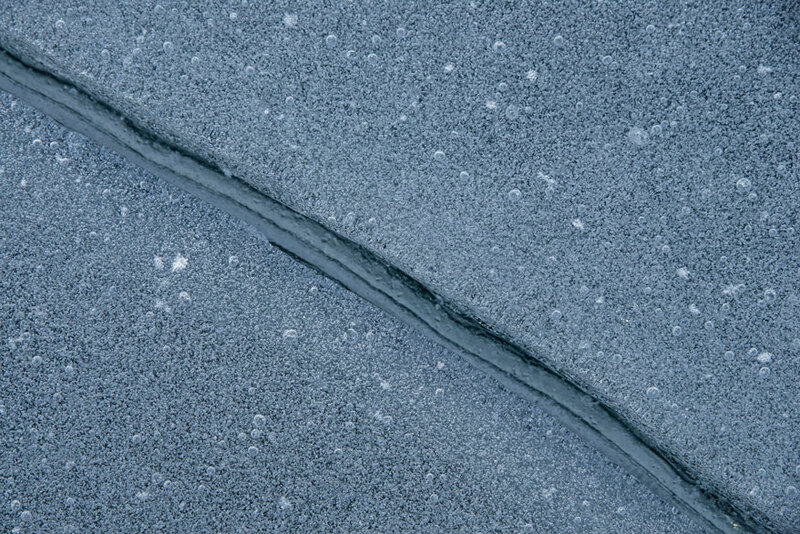 This can be a bit treacherous since it is usually solid ice. Once on the top you can walk up the stream a short distance to the second waterfall. This one is only about 3 feet but is a free falling waterfall. 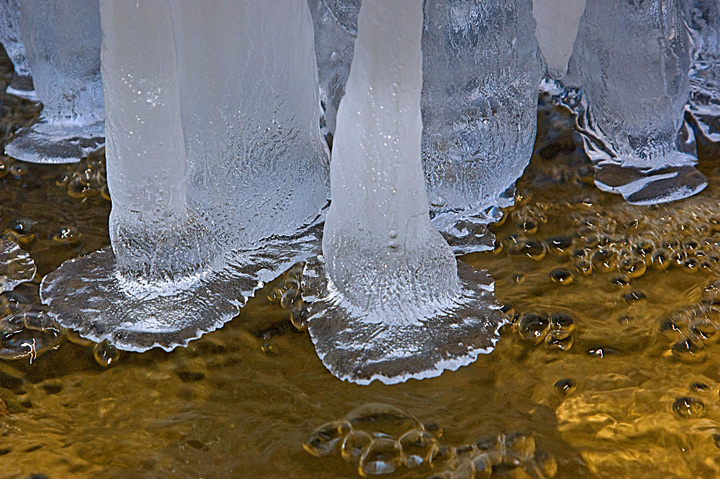 There are usually some ice formations around the waterfall but nothing spectacular. At this point I usually stop but if you can get up over the waterfall you can continue to walk up the gully for quite a ways. The springs provide the water for the stream are found about 100 yards above the waterfall. There used to be a nice ladder to help get over the waterfall but it was destroyed by vandals. You can find additional photos and driving directions to Tripp Falls on my website.